From Salisbury to Mechanicsville, Maryland is home to an abundance of local farms that are fixtures of their communities, welcoming families for generations. And come autumn, festivities really pick up. Carry on the seasonal tradition by visiting one of these wonderful farms and getting lost (not literally!) in a corn maze. Here are our favorites. Adkins Farm Market in Salisbury, Maryland invites you to “take a mini vacation in the country,” according to their website. They offer activities throughout the year, but their fall offerings are particularly awesome. Pick your own pumpkins, take the kids to the play area, and discover the secrets of their seven-acre corn maze. Bowles Farms, LLC in Clements, Maryland claims to be home to southern Maryland’s largest cornfield maze and pumpkin patch. While we haven’t independently verified if it is indeed the largest, we can tell you it’s pretty darn amazing none-the-less. This year, the maze is themed for the Washington Capitals, in celebration of their Stanley Cup win. Maryland Sunrise Farm LLC in Gambrills, Maryland sits on over 570 acres. The corn maze, themed for unicorns this year, is one of the “25 Best to Visit” in the United States according to their website. Find all 10 posts within this eight-acre maze to win a price. Winterbrook Farm invites you to experience the home of “Maryland’s Largest Corn Maze and Fall Festival,” according to their website, starting in mid-September. Explore four unique mazes, totaling 7.1 miles of trails and over 30 acres of corn. Ask about their team challenges, too. Summers Farm in Frederick, Maryland, is home to a 12-acre corn maze with nine-foot tall corn. The maze has a challenging section with various twists and turns and a simpler path, perfect for an afternoon stroll. Cornfusion Corn Maze brings the maize craze to Manchester. This year’s theme is “Secret Agent,” inviting you to “journey into a world of intrigue and espionage,” according to their website. Forrest Hall Farm in Mechanicsville, Maryland has a unique maze design ever year. They are one of the older farms in the area, having been in constant operation for over 100 years. Experience the tradition for yourself this fall. Jumbo’s Pumpkin Patch in Middletown, Maryland has a wide variety of activities, including pick your own pumpkins, hayrides, face painting, concession stand, fall shopping, and a 15-acre corn maze. They will open for their season starting mid-September and will run until the end of October. Gayer Farm in Mount Airy, Maryland opens early this year and stays open longer than most. Their season runs from early September through early November. During that time, make sure to stop in for their fall fun festival, pumpkin picking and excellent corn maze. Since 1951, the Buppert Family has continuously farmed in Marriottsville, providing fresh vegetables, fruits, and livestock. Every fall, they also offer hayrides, access to their pumpkin patch, and a wonderful corn maze. 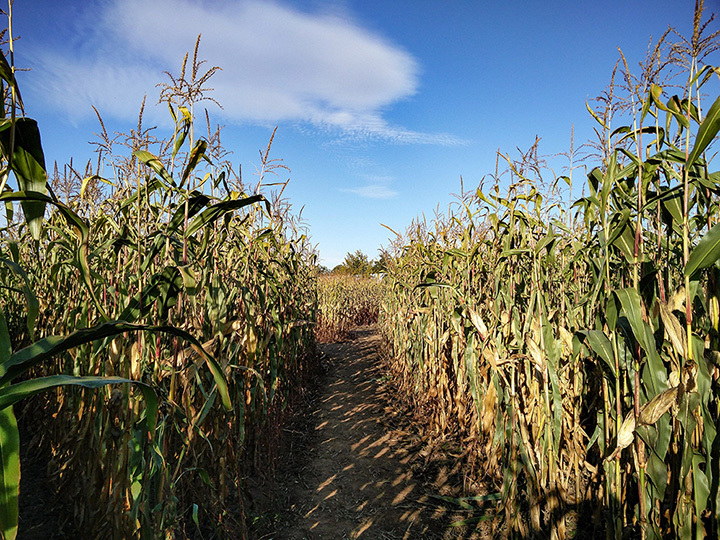 No need to schedule on weekends, simply stop in between 11 a.m. and 4 p.m.
View more Maryland Corn Mazes.